What are the chances that if you look around your room right now, you will find a product branded with that famous “swoosh” symbol? The man responsible for founding what is arguably the world’s most famous sport brand, Nike is Phil Knight, America’s finest business magnate. A native Oregonian, he is also known to be a great philanthropist and a former athlete. Phil Knight worked as a sport correspondent for the Oregonian newspaper, where he would run seven miles to and from home. It was this initial experience that made him the star athlete in the state and he has won titles for his running performances. After he obtained his Master’s degree, he travelled to Japan, where he got the rights to sell the Tiger-brand running shoes. He then partnered with his former coach and created NIKE which is a name that went on to become one of the world’s best known sporting brands. Knight started out his business from a small Plymouth Valiant automobile. A legendary story, his is the classic American dream of making it big with determination coupled with hard work and patience.A friend of Knight’s, Jeff Johnson suggested calling his brand Nike and they created the logo, which is recognized as one of the world’s most powerful ones, for a mere $35. After his stupendous success, Phil moved on to obtain Laika Studios, which he entrusted upon his son, Travis. He turned the fortunes of the company around with the help of his Nike executives. It was under his leadership that Laika studios went on to become one of the best short-film animated studios in the world. Phil Knight’s story is not an overnight success, but that of determination and grit. He was able to manage a business very passionately, due to which, his legacy will remain for years to come. His story isn’t one that is all smooth sailing though. He lost his son Mathew to a scuba diving accident in scuba diving accident back in 2004. He said that the incident helped him put things in perspective and that family was always the most important thing.Knight not only created one of the most memorable brands of all time, but was also able to fend off competition from the likes of European competitors such as Adidas and Puma. After retirement, he assumed the role of chairman of the company. 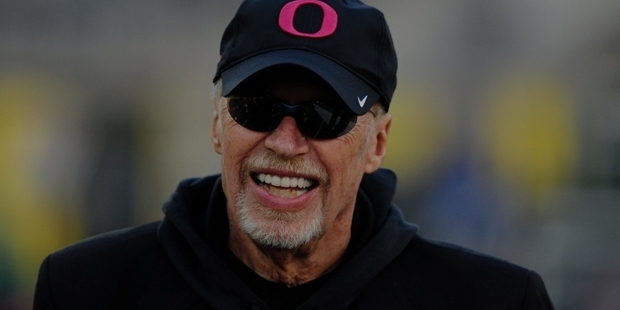 Phil Knight is also a well-known entrepreneur and has contributed close to $230 million to the University of Oregon, where he is also a Hall of Fame member. Apart from this, he has donated hundreds of millions of dollars to other charitable organizations. An inspiration, Phil Knight has touched the lives of millions of athletes around the world with his company and efforts.